This week a landmark project that I have been following for over two years came one step closer to becoming reality. So close in fact that work on The Garden Bridge over the London’s River Thames could commence as early as this summer. Much has been written about The Garden Bridge during the intervening months and I have attempted to digest most of it. There are broadly two schools of thought: that which considers the project an excessive, politically motivated, unnecessary vanity project and that which applauds its vision, ambition and future contribution to the city’s urban landscape. Try as I may to take a balanced view, I have very little time for the naysayers. They make the point that a crossing at this point in the Thames isn’t strictly needed, that established trees will be removed to enable its construction, that the selection process for the bridge’s designers was improper, and that the money, much of which has been donated by private individuals and businesses, might be put to better use elsewhere in the city. I agree and sympathise with each of these challenges to an extent, but to allow these to de-rail what could be one of this century’s greatest contributions to London’s architectural and landscape heritage would be very wrong indeed. It will be interesting to note how many of these bah-humbug types remain in the ‘against’ camp when the bridge is opened, I predict to critical acclaim. Following years of planning and fundraising, on Tuesday The Garden Bridge Trust announced that construction contracts had been signed, paving the way for building to start within a few months. The bridge is due to open in 2018. 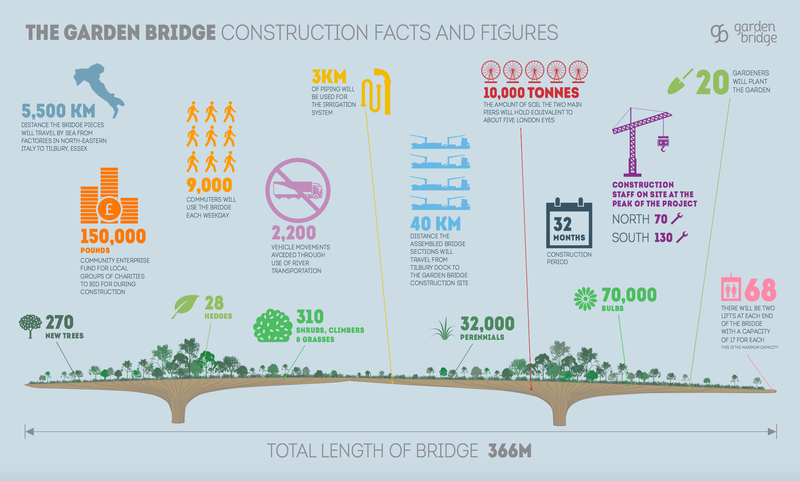 As the infographic above illustrates, the 366m span will be enjoyed by 9,000 commuters each weekday and no doubt a greater number of tourists and sightseers. 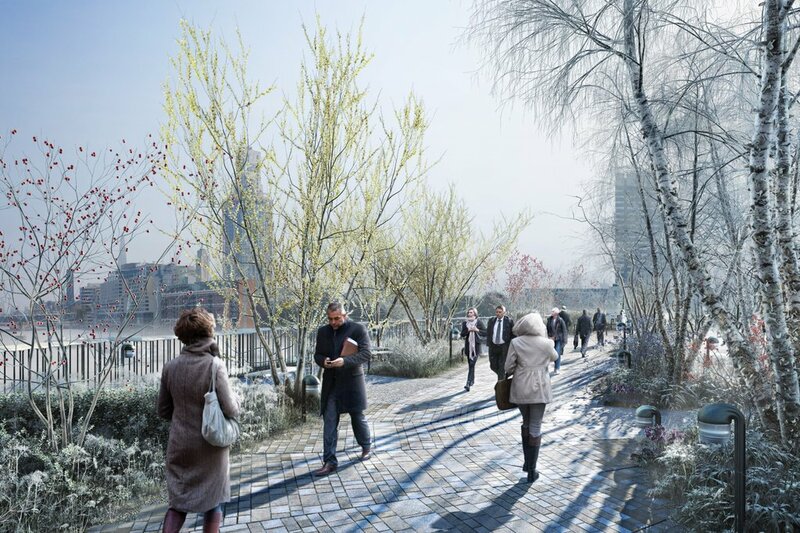 Dan Pearson’s planting scheme, which aims to transport us from formality on the north bank to naturalism on the south bank, will include 600 trees, shrubs, climbers and grasses, plus a further 32,000 perennials carefully selected to provide year-round interest. All will need to be tough enough to survive in one of the coldest and most exposed locations in the capital. The views through foliage and flowers will take in some of London’s other great landmarks, including St. Paul’s Cathedral. To celebrate the start of the final planning stages, The Garden Bridge Trust created the video below, which is perfectly professional but oddly short of detail about the bridge itself. To further whet our appetite the trust have started releasing images illustrating how the bridge will look through the seasons. Below we see a romantic vision of the crossing on a cold, frosty winter’s morning, The Shard seen through a haze of willow catkins and red berries. At the top of this post we can imagine the scene a few months later, in spring, a couple enjoying some of the 70,000 bulbs that will be planted by the bridge’s 20 strong gardening staff. If these renderings are not enough to make the hearts of the cynics skip a beat then they have very hard hearts indeed. London has an astonishing record of delivering great landmark projects that have endured: who’d have thought in the year 2000 that we’d have good words to say about The O2, or that The London Eye would still be rotating? The Garden Bridge will be another world class attraction fit for a world class city. I’ll be standing in the queue on opening day, proud to say I told you so. It’s many years since I left London (which is where I’m originally from) and I hadn’t heard about this, but I think it’s a wonderful idea. It’d be like having a sort of island park in the middle of the river. The idea of having it for pedestrians only… well, it’s a nice idea but how would anyone who is not 100% mobile – ie, physically handicapped or just too weak to walk, manage it? It would be a pity if only the very fit could enjoy it. Hi Val the deck of the bridge will be pretty level with wide walkways and there are 2 lifts at either end of the span, so it should be easy enough to get wheelchairs and the like up the so that everyone can enjoy the experience. There will also be lots of benches to take a rest on. I am totally for the garden bridge for London and agree with you Dan that it will be an enduring landmark for the city. I have followed the project from the outset being a big fan of Thomas Heatherwicks work and cannot believe how much anti bridge feeling has been unleashed…hopefully I will see you in the queue on the opening day! It’s a date! There are a lot of killjoys and folk with no imagination around – fortunately they rarely prevail. But sometimes we have a strange lack of vision and ambition in this country, perhaps a reaction to our colonial past. I believe the bridge will be something we can all take pride in, an antidote to all the skyscrapers and foreign-funded projects springing up in town. I think we’re way too short on visionary ideas these days and I think this one will be an enduring stunner! Me too. And I am sure visitors from around the globe will love it as well. So folks will buy off on the Gherkin and the London Eye (it’s a Ferris wheel, folks, no matter how millenial) but not on a garden path across the Thames? Really? William Morris spins in his grave. In my view we need to pay a lot more attention to beautification in this country, whether it be better architecture, better product design or more lovely public spaces. Good, pleasing design should cost nothing more as William Morris knew so well. Absolutely wonderful idea! Another landmark of London. I keep my fingers crossed and I am sure it will be a great success. I hope so Paul. It will be another good reason to visit London! Wishing you a lovely weekend. Love the idea. I’m originally from London too, and am old enough to remember it dirty, shabby and full of bomb sites. In fact I even have a very dim early recollection of it with no lights except searchlights. No city can stand still, and there will always be those who condemn any new project. I hope I’m still wal;king when they open it. Any chance mobility scooters will be allowed on do you think? The best news ever – have been following this project and so pleased to hear, Dan, that the start is eminent. It’ll be wonderful for London!! Thanks for your comment. I agree there are a few aspects of the way the project has been handled that appear questionable. However The Guardian clearly has a real downer on the whole thing, rather gleefully seeking out any storyline that might tarnish its reputation. I am not saying they are incorrect, but they are as firmly entrenched in their opposition as I am in my support so we must agree to differ. I am going to watch it now Kate. Thanks for the tip. I remember when you first mentioned about ‘The Bridge’ and you have all reasons to be proud! There is so little greenery and open garden spaces in our urban areas, it is a pity that we have lost the great tradition of creating city parks. I think this is a an inspired project and a great use of public money – far better than some of the usual government vanity projects. I quite agree. It’s also a ‘feel good’ idea with great architects and designers on board. It makes me sad that some people are so negative about it. An addition to green space in a city centre is welcome but knowing how these big projects so often run over budget I worry that the public purse may be stretched yet again. It is a visionary project and I wish it every success, I will keep an eye on matters by reading Mr TT’s New Civil Engineer and see what they have to say about it. I am very interested in this project, and I will think it will be an amazing achievement, but I just can’t get past just how much money its going to cost. Yes, as soon as one starts talking millions one rapidly loses all sense of proportion. I do it all the time at work and forget just what vast sums we deal with. Like you I hope they can bring the project in on budget.